UDM Downloads > GoldenSection Notes! What? You've not heard about GSNotes? Everybody on the Internet is talking about it. GSNotes is a user-friendly e-notebook that organizes your notes in a folder tree format for your convenience. The program has received dozens of awards and supports over 20 languages. In addition to keeping and organizing notes, GSNotes can perform any word processing task and has all the necessary features, such as changing font size and style, highlighting, underlining, using italics, bold typing, margins, etc. You can also print out any document that you've created with this program. The first thing you will love about GSNotes is the interface. Its simple design allows you to easily navigate among the documents and perform all necessary tasks painlessly. If you think that a straightforward and business-like approach means ugly, that is not true. We've made sure to include some "eye candy" - the interface resembles a small workbook, complete with the "double rings" of a daybook at the junction. This nice touch has won the approval of thousands of loyal GSNotes users. This software is also fully customizable and will adjust according to your needs. The software comes complete with built-in help files. 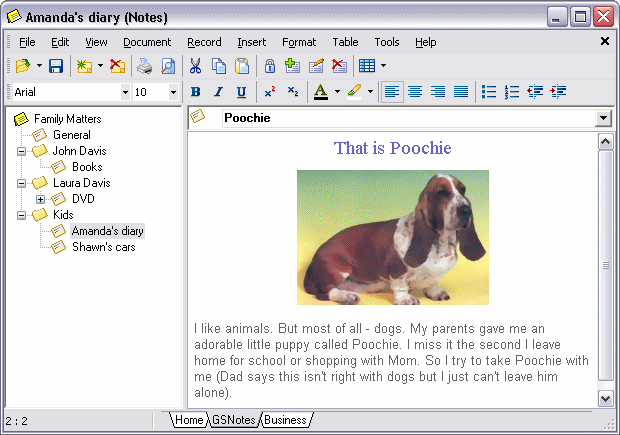 GSNotes' Help features are clear, concise, and have simple explanations including pictures of the toolbars, windows, and other components of the program. GSNotes can contain an unlimited number of project files and enclosed documents. It features customizable toolbars and message dialogs, user-defined fonts and documents background, and can auto save the settings and the form position. A nice addition to this program is the insert menu, which allows you to insert various images (over 20 formats supported) or the date/time, as well as links to files. URL auto detection is available too! Get your copy now!